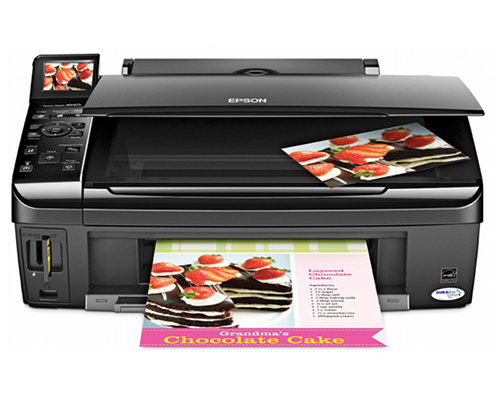 The Epson Stylus NX415 is a multifunction consumer-grade inkjet printer built to print, scan and copy on a personal scale. With support for most consumer equipment and some integrated functions as previously only seen on higher-end industrial paper devices, the NX415 may be a decent choice for users in need of high-resolution printing in a small, lightweight package at a low initial price. The NX415 measures 17.7" by 13.5" by 7.2" with trays shut and 17.7" by 21.3" by 11.7" with all trays open and extended. 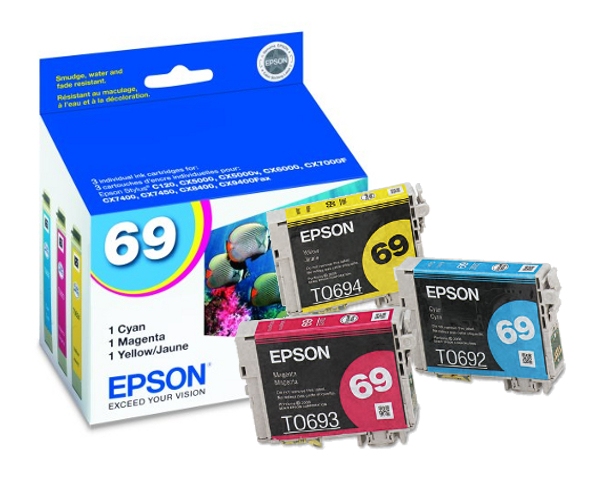 Because the printer cannot output paper with its trays shut, Epson designates these as "Printing" and "Storage" measurements, meaning that the first set of measurements is the one you will need to pay attention to when making space for the printer to be used regularly. 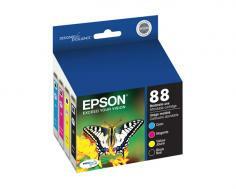 The printer weighs an extremely light 12.8 lbs, making it easily transported if necessary. The NX415 has inputs for many popular memory cards to eliminate the need to send photos from a camera to a computer before printing. It supports Compact Flash, Microdrive, Sony Memory Stick (MagicGate, MagicGate Memory Stick Duo, Memory Stick PRO, and Memory Stick PRO Duo), SD (SDHC, MiniSD, MiniSDHC, MicroSD, and MicroSDHC), as well as MultiMediaCard (xD-Picture Card, Type-M, M+, and Type-H). It also includes a PictBridge port allowing you to print directly from digital cameras and mobile phones. It also has a single USB 2.0 port, but networking is not built-in to the printer, nor is it available as an add-on. To network the printer, one will need to configure it as a shared printer, requiring the system it is connected to to be on and networked in order to enable remote printing. The NX415 produces copies in black and white at the impressive speed of 33 pages, a marked improvement over lower-end printers in the NX series and comparable with many higher-end laser copiers. It will produce up to 1-99 copies simultaneously, though the small paper capacity does make this somewhat impractical as a copier to process larger documents. The NX415 has a maximum print resolution of 5760 by 1440 dpi, consistent with other high-resolution photo inkjet printers and well above the color print depth offered by most laser printers. Furthermore, the NX415's color ink is designed to produce smudge-resistant, water-resistant, and fade-resistant prints. The NX415's built-in color flatbed scanner offers resolutions as high as 9600 by 9600 dpi in 48-bit color, well above most color office scanners. The NX415 supports printing either with or without a PC. Configured by external software, the printer will print to sheets 8.5" by 11", 8.5" by 14", A4, B5, A5, A6, half letter, or user definable (3.5"-44" long), and without it will print to letter paper or photo paper measuring 4" by 6", 5" by 7", or 8.5" by 11". It will also produce index sheets if desired. The printer will print to envelopes sized at No. 10, but also to plain paper or bond paper. When printing borderless sheets, the NX415 can print onto paper sized 3.5" by 5", 4" by 6", 5" by 7", 8" by 10", 8.5" by 11", or A4, as well as to custom presets. The printer prints at speeds of 4.3 pages per minute in black or in color, well below the speeds offered by other inkjet printers, consumer laser printers, or industrial ones. The NX415 does not include an automatic document feeder and has a maximum paper capacity of 100. This makes it highly impractical either to produce large volumes of copies or to use the NX415 as the sole printer in an office with a relatively high paper throughput, as it will need constant refilling of both paper and ink. As with many other Stylus models, a number of users report issues with the NX415 misreporting the quantity of ink in cartridges, not recognizing cartridges (especially non-Epson cartridges or refilled ones), and refusing to function when only one of the printer's cartridges are empty. Review it: "Epson Stylus NX415 "
The NX415 ships with four cartridges -- black, cyan, magenta, and yellow -- which will require regular replacement. There are three sizes of cartridges available for the printer: replacement black cartridges are available in moderate-use, standard-capacity and high-capacity sizes, while color cartridges are available in moderate and standard-capacity sizes as well as multi-packs containing all three color cartridges. High-capacity cartridges for the NX415 are rated at printing approximately 370 pages, while standard-capacity cartridges print 245 and moderate-use cartridges are rated at 170 pages. Given the low cost of the NX415, ink refills for the printer will very quickly prove costlier than the actual price of the printer. While this is not in and of itself a bad thing, it is an appraisal of the printer's build quality and of its long-term potential as a printing solution.